Lesbians, gay men, bisexuals and transgender adults are, on the whole, less religious than the general public. About half (48%) say they have no religious affiliation, compared with 20% in the general public; this pattern holds among all age groups. LGBT adults who do have a religious affiliation generally attend worship services less frequently and attach less importance to religion in their lives than do religiously affiliated adults in the general public. Also, a third (33%) of religiously affiliated LGBT adults say there is a conflict between their religious beliefs and their sexual orientation or gender identity. That sentiment is even more prevalent among the general public. About three-quarters of white evangelical Protestants (74%) and a majority of all U.S. adults with a religious affiliation (55%) say homosexuality conflicts with their religious beliefs. Among all adults in the general public, there is a strong correlation between the frequency of church attendance and the belief that homosexuality should be discouraged. The new Pew Research survey asked LGBT respondents to rate six religions or religious institutions as friendly, neutral or unfriendly toward the LGBT population. By overwhelming margins, most rate all six as more unfriendly than friendly. About eight-in-ten LGBT respondents say the Muslim religion, the Mormon Church and the Catholic Church are unfriendly toward them, while one-in-ten or fewer say each of these religious institutions is friendly toward them. Similarly, about three-quarters of LGBT adults (73%) say that evangelical churches are unfriendly toward them, about a fifth (21%) consider these churches neutral and just 3% say evangelical churches are friendly toward the lesbian, gay, bisexual and transgender population. By comparison, fewer LGBT adults see the Jewish religion and non-evangelical (mainline) Protestant churches as unfriendly toward them, but more say each is unfriendly rather than friendly by a large margin. And about three-in-ten LGBT adults (29%) say they personally have “been made to feel unwelcome at a place of worship or religious organization,” as detailed in Chapter 2 on social acceptance. Nonetheless, about half of LGBT adults (51%) have a religious affiliation, including a sizable minority of all LGBT respondents (17%) who have a religious affiliation and also say religion is very important in their lives. Most of those with a religious affiliation are Christian (53% Protestant, 26% Catholic and 1% some other Christian faith). Among LGBT Catholics, two-thirds consider the Catholic Church unfriendly toward the lesbian, gay, bisexual and transgender population, while 26% say it is neutral and just 6% see it as friendly. By contrast, among LGBT adults who are white mainline Protestants, most say that non-evangelical Protestant Churches are either friendly (20%) or neutral (54%) toward them, while 24% see these churches as unfriendly. The remainder of this chapter explores all of these patterns in more detail and provides quotes from survey respondents on topics related to religion. When it comes to religion, the LGBT population has a distinctly different profile than the general public. 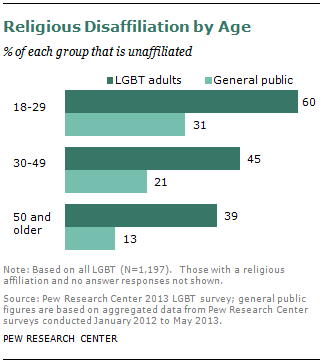 Fewer LGBT adults have a religious affiliation. About half of LGBT respondents describe themselves as atheist, agnostic or having no particular religion (48%)─more than double the portion of the general public that is religiously unaffiliated (20%). 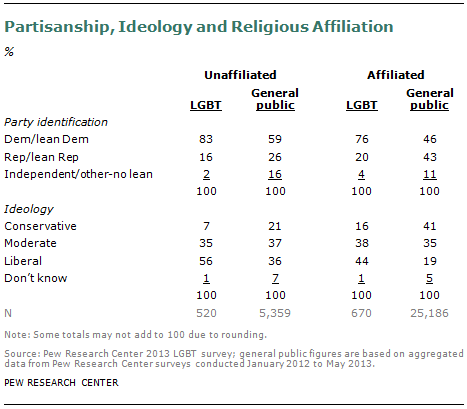 Like the U.S. general public, LGBT adults with a religious affiliation are primarily Christian. In all, 42% are Christian (including 27% who are Protestant, 14% who are Catholic and 1% who belong to other Christian faiths). One-in-ten identify with Judaism (2%) or some other non-Christian faith (8%). Young LGBT adults are particularly likely to have no religious affiliation, a pattern that is also found among the general public. 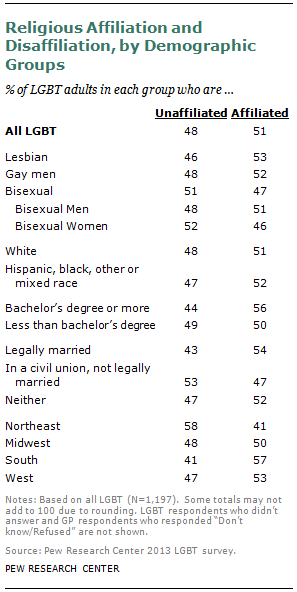 However, compared with the general public, a higher share of LGBT adults are unaffiliated across all age groups. For example, among adults ages 18 to 29 in the general public, 31% are religiously unaffiliated, while roughly double that share (60%) are unaffiliated among LGBT adults of the same age. And roughly one-in-eight adults ages 50 and older in the general public are unaffiliated (13%), compared with about four-in-ten (39%) of older LGBT adults. Apart from age, there are few subgroup differences among LGBT adults in the tendency to be religiously affiliated or unaffiliated. Gay men, lesbian and bisexual adults are about equally likely to be religiously affiliated. Similarly, within the LGBT population there are no significant differences in religious affiliation levels among whites compared with racial and ethnic minorities, or among college graduates compared with those without a college degree. While marriage is correlated with religious practice in the general public, being married or in a civil union is not significantly associated with having a religious affiliation among LGBT respondents. There are modest differences across regions. LGBT respondents living in the South are more inclined to have a religious affiliation (57%) than those living in the Northeast (41%). Unlike the general public, LGBT adults tend to tilt strongly toward the political left regardless of whether they are religiously affiliated or unaffiliated. About three-quarters of LGBT adults with a religious affiliation (76%) identify as Democrats or as independents who lean to the Democrats—as do 83% of LGBT adults with no religious affiliation. LGBT adults identifying as liberals outnumber conservatives by more than two-to-one among both those who have and those who do not have a religious affiliation. However, LGBT respondents with a religious affiliation are somewhat more likely than those who are unaffiliated to identify themselves as conservatives (18%, compared with 7% among the unaffiliated). Religious commitment. LGBT adults also exhibit lower levels of religious commitment. Compared with the general public, fewer LGBT adults attend worship services regularly (13% attend at least weekly, compared with 37% of the general public). 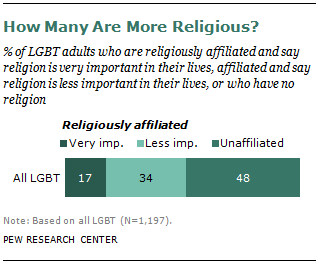 And religion tends to be less salient in the lives of LGBT respondents. A fifth (20%) of LGBT adults say that religion is very important in their lives, compared with roughly six-in-ten (59%) among the general public. Some, but not all, of these differences in religious commitment are related to the lower levels of religious affiliation among LGBT adults. However, even after controlling for affiliation with a religion, LBGT adults exhibit lower levels of religious commitment. LGBT respondents with a religious affiliation attend worship services less frequently than do adults in the general public who have a religious affiliation. Among those who have a religious affiliation, a fifth (20%) attend religious services at least weekly, 36% attend monthly or yearly and about 44% say they seldom or never attend. Among adults in the general public who have a religious affiliation, the pattern is reversed, with about a fifth (18%) saying they seldom or never attend services, 36% attending monthly or yearly and 45% attending at least weekly. The vast majority of people with no religious affiliation, both those who are LGBT and the general public, say they seldom or never attend worship services. There are modest differences among gay men, lesbians and bisexual adults in worship service attendance. Gay men are less likely than lesbians to attend services regularly; fully 71% of gay men say they seldom or never attend worship services, while 57% of lesbians say the same. Neither gay men nor lesbians are significantly different from bisexual adults in their frequency of worship service attendance, however; 64% of bisexual adults say they seldom or never attend services. There is a similar pattern when it comes to the importance of religion. Compared with the general public, LGBT adults are less inclined to see religion as very important in their lives; a fifth (20%) say religion is very important to them, 23% say it is somewhat important and a majority (55%) say religion is not too or not at all important in their lives. By contrast, 59% of all U.S. adults say religion is very important in their lives. Some, but not all, of the difference between LGBT adults and the general public is explained by the higher percentage of religiously unaffiliated lesbian, gay, bisexual and transgender adults. Religiously unaffiliated adults are less inclined to consider religion personally important. Even among those with a religious affiliation, however, LGBT respondents place less importance on religion. For example, a third of LGBT adults with a religious affiliation say religion is very important in their lives. This compares with two-thirds (67%) of those who are religiously affiliated in the general public. There are modest differences in religious importance among LBGT adults. A majority of lesbians (56%) consider religion either very important or somewhat important in their life. This compares with 40% among bisexual adults (42% among bisexual women) and 39% among gay men. While LGBT adults generally are less religious than American adults as a whole, a sizable minority of them show a high level of religious commitment. About one-fifth (17%) identify with a religion and consider religion very important in their lives. This group of more religiously committed adults also attends worship services more frequently, as expected (41% say they attend weekly). They are more likely than other LGBT adults with a religious affiliation to be bisexual women and they are more likely to reside in the South. Apart from those differences, they are similar to other LGBT adults with a religious affiliation on a number of demographic background characteristics including age and marital status. The relatively high share of LGBT adults with no religious affiliation could be explained, in part, by real or perceived tensions with U.S. religious groups and institutions. The Pew Research survey of LGBT adults asked about the extent to which respondents feel a conflict between their religious beliefs and their sexual orientation or gender identity. Overall, about a quarter of LGBT adults (26%) say there is a conflict between their religious beliefs and their sexual orientation or gender identity, while a majority (73%) says there is no conflict. Those having a religious affiliation are more inclined to see a conflict (33% of the affiliated, 18% of the unaffiliated). Nevertheless, a solid majority of both groups says there is no conflict (66% of the affiliated, 82% of the unaffiliated). Among LGBT adults with a religious affiliation, a third (33%) say there is some conflict between their religious beliefs and their sexual orientation: a fifth (20%) say there is “a lot” of conflict, and 13% say there is “a little” conflict. Two-thirds (66%) say there is no conflict. Gay men and lesbians are somewhat more inclined than bisexual adults, especially bisexual women, to see a conflict between their religious beliefs and their sexual orientation. Roughly three-in-ten gay men (29%) and lesbians (31%) say there is a conflict, compared with a fifth (21%) of bisexual adults. These viewpoints contrast sharply with opinions in the general public about the degree of conflict between religious beliefs and homosexuality. 41% say there is no conflict. Fully 74% of white evangelical Protestants in the general public say there is a conflict between their religious beliefs and homosexuality, as do 62% of white non-Hispanic Catholics and 58% of black Protestants. Only one of the major U.S. religious groups is substantially less likely to see a conflict: 41% of white mainline Protestants say there is a conflict between their religious beliefs and homosexuality, while a 55% majority takes the opposite view. Those who attend worship services more frequently, across all faiths, are especially likely to see a conflict between their religious beliefs and homosexuality. Two-thirds of this group say there is a conflict, including half (50%) who say there is a lot of conflict. 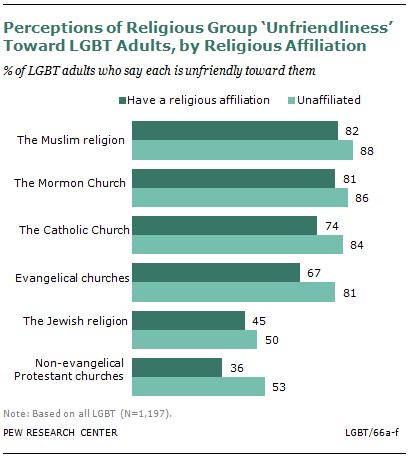 Many LBGT adults see major religious institutions as unfriendly toward them. And as shown in Chapter 2 on social acceptance, about three-in-ten LGBT adults (29%) say they personally have been made to feel unwelcome in a church or religious organization. More than eight-in-ten LGBT adults surveyed say the Muslim religion (84%) is unfriendly to those who are lesbian, gay, bisexual or transgender, while less than 1% say the Muslim religion is friendly and 13% consider it neutral. Perceptions of the Mormon Church are similar, with 83% of LGBT respondents saying the Mormon Church is unfriendly toward them. About eight-in-ten (79%) consider the Catholic Church unfriendly, and 73% say the same about evangelical churches. By comparison, the Jewish religion and non-evangelical (mainline) Protestant churches are seen as less hostile, although many more LGBT adults consider these institutions to be unfriendly than friendly toward them. Roughly half of the LGBT adults surveyed say the Jewish religion (47%) is unfriendly toward the LGBT population, just one-in-ten say the Jewish religion is friendly and about four-in-ten (41%) say it is neutral. Perceptions of non-evangelical Protestant churches are similar; 44% of LGBT adults say these churches are unfriendly, 10% say they are friendly and 43% say they are neutral. Perceptions of these religious institutions among LGBT adults loosely correspond with survey findings on attitudes toward homosexuality within each of the religious groups. Members of the U.S. general public who identify as white evangelical Protestant, black Protestant, Mormon and Muslim are less accepting of homosexuality than the general public as whole. Each of these groups is more likely to say that homosexuality should be discouraged by society rather than accepted by society, according to Pew Research surveys, with the exception of U.S. Muslims, who are about equally likely to say that homosexuality should be accepted as discouraged by society. White mainline Protestants and Jews (along with the unaffiliated) are more accepting of homosexuality than the general public as a whole. Catholics are also more accepting of homosexuality than the general public as whole, although the Catholic Church officially teaches that homosexual behavior is a sinful act. Among LGBT Catholics, two-thirds (66%) say the Catholic Church is unfriendly toward them, just 6% see the Church as friendly and 26% say it is neutral. By comparison, unaffiliated LGBT adults are more likely to see the Catholic Church as unfriendly (84%), and 74% of LGBT Protestants say the Catholic Church is unfriendly. Perceptions of religious institutions vary somewhat between LGBT adults with and without a religious affiliation. Eight-in-ten or more of both affiliated and unaffiliated LGBT adults say the Muslim religion and the Mormon Church are unfriendly toward them. The affiliated are less negative than those with no religious affiliation particularly when it comes to evangelical churches, but a majority of both groups says evangelical churches are unfriendly toward LGBT adults. Two-thirds of the affiliated (67%) and 81% of the unaffiliated say evangelical churches are unfriendly toward the LGBT population. The religiously affiliated are also less inclined to see non-evangelical Protestant churches as unfriendly; 36% of the affiliated (compared with 53% of the unaffiliated) say non-evangelical (mainline) Protestant churches are unfriendly. Among LGBT adults who are white mainline Protestants, roughly equal portions consider non-evangelical Protestant churches overall to be friendly (20%) or unfriendly (24%), while 54% says these churches are neutral. Explore some 300 quotes from LGBT survey respondents about their coming out experiences.